These days, laptop batteries no longer suffer from the “memory effect” and related life-shortening afflictions. But that doesn’t mean modern notebook batteries are maintenance free—if you want to keep your MacBook’s battery performing at its best, you need to take care of it. As I noted in our Essential Mac Maintenance feature, you should calibrate your laptop’s battery once every month or so. (Apple’s notebook-battery Web page provides more information about MacBook batteries, including a link to the company’s recommended calibration procedure and a link to an iCal calendar that will remind you each month to calibrate.) Today’s Gem, Watts, aims to make such maintenance both easier and more effective. It also incorporates noteworthy features of a few other portable Gems. Watts sits in your menu bar, providing an improved alternative to Apple’s stock battery menu item. Like SlimBatteryMonitor ( ), you can customize Watts’ menu-bar display so that it takes up less room than Apple’s version: you can choose to show just a battery icon (which changes to an AC plug when your laptop is connected to its AC adapter), just the time remaining, or just the percentage charge remaining. Like Gems favorite Unplugged ( ), Watts uses Growl to notify you whenever your laptop switches to battery power—useful for those times when your MagSafe connector accidentally gets disconnected—or from battery to AC power. Watts can also notify you, like Unplugged and HardwareGrowler, when your laptop’s remaining charge dips below the percentage you choose. And like older Gem coconutBattery (and several similar utilities out there), Watts can provide detailed information about the status of your MacBook’s battery. 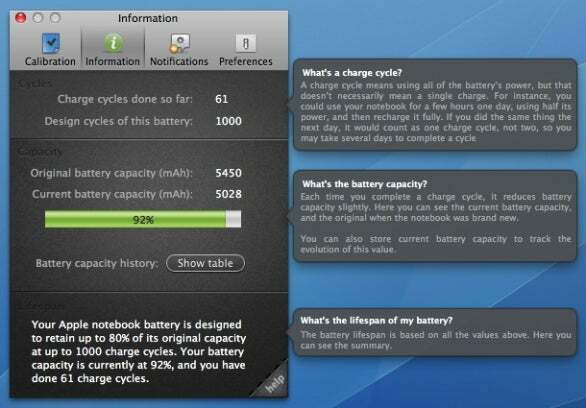 Choose Calibration & More from Watts’ menu and then click the Information button, and Watts displays the number of complete charge cycles you’ve performed on your battery (along with the number of cycles the battery was designed to handle), and the original and current capacity of your battery. A click on the Help button displays explanatory text about each bit of information, and clicking Show Table displays a history of your battery’s capacity—you can manually add the current data to the table. Plug in the computer and fully charge the battery. Keep the laptop plugged in, with a fully charged battery, for at least two hours. Unplug your MacBook’s AC adapter so the computer is running off its battery. Allow the laptop to sleep—unplugged from the AC adapter—for at least five hours. Reconnect the AC adapter and fully charge the battery. At the other extreme, if you won’t be using your MacBook for a while—or if you have an older Apple laptop that lets you swap batteries and you won’t be using one of those batteries for a while—Watts includes a feature for getting the battery to the ideal charge state for storage. Battery vendors recommend against storing a battery for extended periods with a low charge (to avoid the risk that the battery will die completely), and Apple recommends a storage-charge level of 50 percent, rather than full. If you're getting ready to store your MacBook or battery, Watts will notify you when the battery reaches a 50-percent charge. Of course, you could get all this battery information from a combination of free utilities, and you could set up an iCal reminder to follow Apple’s battery-calibration routine every month or so. But there’s something to be said for having all these features in one nifty utility that also walks you through the calibration process when the time rolls around.